The DCT title Spellbound is best remembered today as the proto-Misty, the first girls’ title to be the first to be a horror/Goth title. Spellbound lasted for just 69 issues and merged into Debbie. Ironically, Spellbound folded in the same month Misty started. In the wake of the lingering affection for Misty, Spellbound is being rediscovered and her issues are becoming serious collectors’ items. Spellbound is unusual for not having a girl’s name as her title, a la Bunty, Debbie, or even Misty. Because of this, no female host acts as the female the comic is named after or appears as a cover girl. This role is covered by The Supercats, regular characters in Spellbound who originally appeared in Diana as “The Fabulous Four”, and were resurrected in Spellbound to the point of dominating it. The comic’s club is named after the Supercats, they are the fictional writers of the letters page, and the weekly horoscope, the Zodiacat, is Supercat-themed. And when Spellbound merged into Debbie, the Supercats were the ones who carried on in the merger. The theme of ancient Egypt is running high in the first issue, beginning with its first gift: the mystic sun pendant. It continues with the first Spellbound story, “When the Mummy Walks…”. The gorgeous artwork in its splash page hits you right in the eye and draws your attention straight into the comic the moment you open it. A Victorian museum featuring an exhibition on ancient Egypt incurs the curse of the mummy, which has broken out of its sarcophagus. No, it isn’t King Tut – it’s an Egyptian priestess. Next is the other Spellbound regular character, Damian Darke. He hosted the weekly complete stories, which were of course spooky. In his first story, “Spectre from the Flame”, Jane Armitage senses something strange about the latest arrival in the antique shop where she works, an old candlestick. A burglar trying to steal the candlestick finds out too late what it is – the candlestick belonged to none other than the infamous Judge Jeffries! But for once we are rooting for Jeffries when his spectre appears to show the burglar the justice he was famous for. All the same, Jane is relieved when the candlestick gets sold. After Spellbound folded, Damian Darke carried on his stories in Debbie and Mandy. The second serial is “The Secret of Silver Star”. It feels a bit out of place in this spooky-themed comic as there is no supernatural theme about it, not even the titular horse being a spectre or something. Instead it’s about a horse that has to be put into hiding when it is to be destroyed. Perhaps the story’s mystery theme – an unknown saboteur trying to destroy the stables – is what is supposed to tie it into the comic. All the same, it does not feel like it really belongs in this type of comic and would be better off in a more traditional DCT title like Mandy or Judy. After the text story “Nightmare” (which turns out to be a false alarm for the protagonist), we meet the Supercats in person. They are a group of intergalactic super-heroes: Helen Miller the leader despite her lack of superpowers; Hercula, who is super-strong; Electra, who can generate electricity; and Fauna, who can change colour. Their first adventure in Spellbound carries on the ancient Egypt theme. They land on a planet that looks like ancient Egypt and the Egyptian Sun God wants Helen as his bride. But it isn’t a wedding to make her so – it’s being sacrificed on his altar! It would not be complete without a story regarding an evil force of some kind taking possession of the protagonist, and this we get with “The Haunting of Laura Lee”. Laura Lee had only played the piano for fun. But that changes when she acquires a mysterious ring that won’t come off. All of a sudden she can play brilliantly, but she senses it wasn’t her playing. What’s more, she’s playing until she’s exhausted. She doesn’t like it one bit. In “I Don’t Want to be a Witch”, Celia Winters does not want to follow the family tradition of becoming a witch and insists on going to an ordinary school. However, her Aunt Armida is out to change her mind, which means the story will follow the pattern of who will win the argument. Finally, we come to “Lonely Lucy”. There is no outright supernatural theme, but it still blends into Spellbound better than Silver Star because it is a dark story, has a period setting, highwaymen, and persecution that stems from ignorance and superstition. Lucy Pilgrim has been dumped in an orphanage, which, as you might expect, is a cruel one. But for Lucy it’s even crueller as the children call her a witch because she’s left handed. She runs away, but runs slap bang into the highwayman himself! Has she jumped from the frying pan and into the fire? And will the branding of Lucy as a witch just because she’s left handed continue? There are no humorous cartoon strips in the first issue to lighten things up a bit, as Miss T did in Misty. 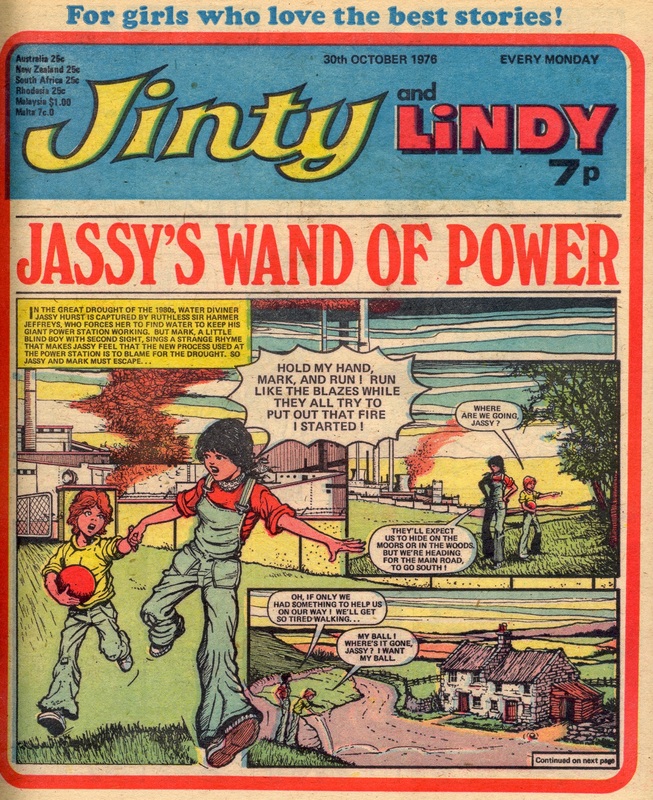 “Jassy’s Wand of Power” is the lead story on this issue; it takes up the front cover and runs to three and a half pages, oddly enough – but then there are only 3 panels on this front cover so I guess that means it is the equivalent of about three ordinary pages. It’s nice having a page of comics on the cover, really draws you in. In this episode, Jassy is starting to raise people’s awareness of the dangerous industrial process that Sir Harmer Jeffreys has been using. They still have to manage to get further away from him without either getting caught – and at the end of the episode they have to face a hungry and thirsty lion too! Stefa is continuing in the grip of her grief – she is cooking her own food as her dad has forbidden her mother to cook for her until she comes to her senses. There is nearly a deadly chip pan fire as a result, and it is Stefa’s classmate who saves her. No gratitude results of course as this is the classmate who has an eerie likeness to Stefa’s dead friend. Hugh Thornton-Jones has two stories in this issue – he has taken on the art duties for “Champion in Hiding” from Mario Capaldi, and he has also drawn the last episode that Katie Jinks appears in. In this story, Katie is chasing a wee black kitten that you’d think woud be a lucky cat – but who brings disaster to all whose path she crosses! Of course in the end the little kitten is given to Katie, who is very happy to have a kitten jinx in her life. Covers from this period seemed to be very fond of showing off the athletic prowess of “Miss No-Name”. This one demonstrates how hurdling enables Lori to make a fast getaway. But she still can’t get away from those nasty Crabbes. She thinks she has found a safe haven but bumps into them again – hence the fast getaway on the cover. 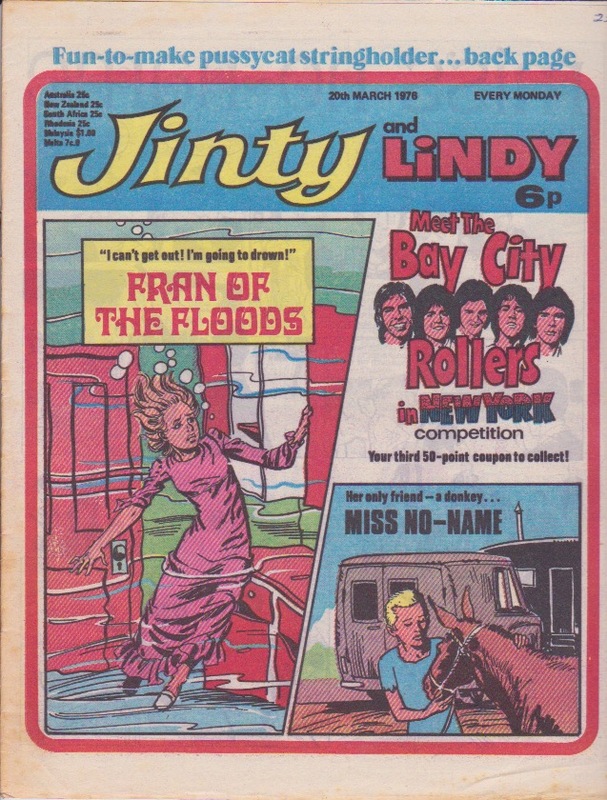 Ironically, hurdling enables Katie the Jinx to make a fast getaway too in this issue – from an angry Mum – after she was daydreaming too much and flooded the kitchen. She had been daydreaming on how she would have fared in previous times. She decides she would have been just the same – except that she wouldn’t be able to get away so quickly in the clothes of the period and is thankful for modern skirt lengths. The days of Penny Crayon and Do-It-Yourself Dot seem to be over. We are now in the era of Alley Cat. “For Peter’s Sake” is fully established in this episode. Gran has died, leaving Corrie with a note to push Old Peg to Peter in the full confidence that the pram will cure her sick brother. But Corrie has to push Old Peg all the way from Scotland to London, so we’re in for a lengthy story full of adventures. 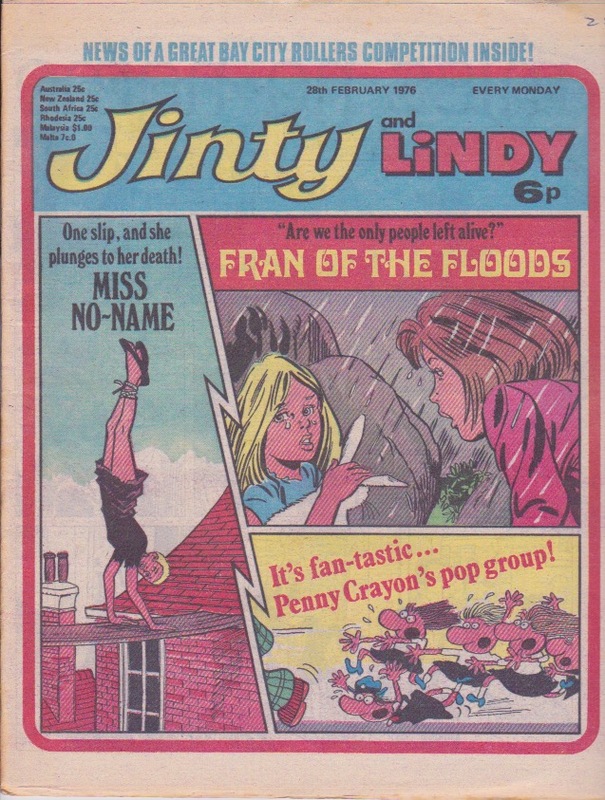 And the same still goes for “Fran of the Floods”. Fran and her friend Jill have now fallen foul of a cult movement that whips them into ploughing fields in the never-ending rain. They don’t see any way to escape, but we know they will. Meanwhile, Miss Wortley has put the best tracker in the district on the trail of Betsy and Mary. But the tracker does not like the cruel Miss Wortley either and ends up helping the girls to fake their deaths and taking the heat off. But it looks like there is another cruel woman coming along to ill-treat Betsy and Mary…. Save Old Smokey is now on its penultimate episode. Gresby looked set to win, but now an emergency has forced him to seek the help of the very people he was trying to destroy! Friends of the Forest ends with Maya revealed to be the offspring of an elopement in Colonel Weatherby’s family due to his snobbishness. He is now remorseful and this becomes instrumental in giving Sally and Maya the happy ending. Next week is “Then There were 3…”. 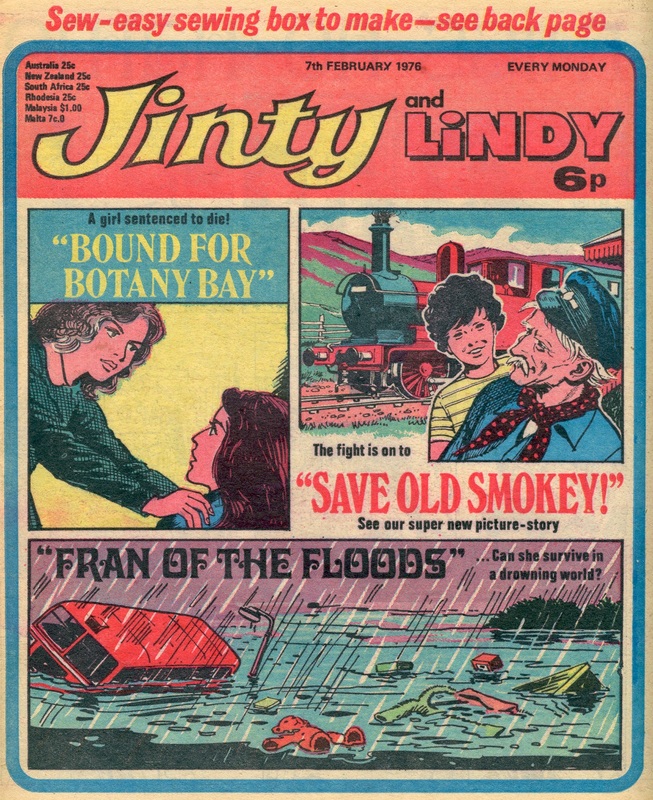 This story is drawn by Phil Townsend, who is also drawing “Save Old Smokey”, so it’s going to be another overlap of artwork next issue. Stacey thinks she has got everything sewn up with her hypnotic powers over Tania, including planting suggestions to cut her off from avenues of help. But the blurb for next week tells us that Stacey has overlooked something. Unfortunately, it does not sound like it is going to provide the rescue. Ma Siddons has been commissioned to improve the IQ of a dimwitted bulldog. Dora Dogsbody is of course lumbered with the hard draft. There is an unexpected twist at the end that saves the day. We can’t help wondering if it was fixed as it is a bit hard to swallow. But it does put Ma Siddons well and truly in her place – until the next issue anyway. Fran is in danger of drowning while diving for food in a submerged village – and all for nothing because the food has already been taken. 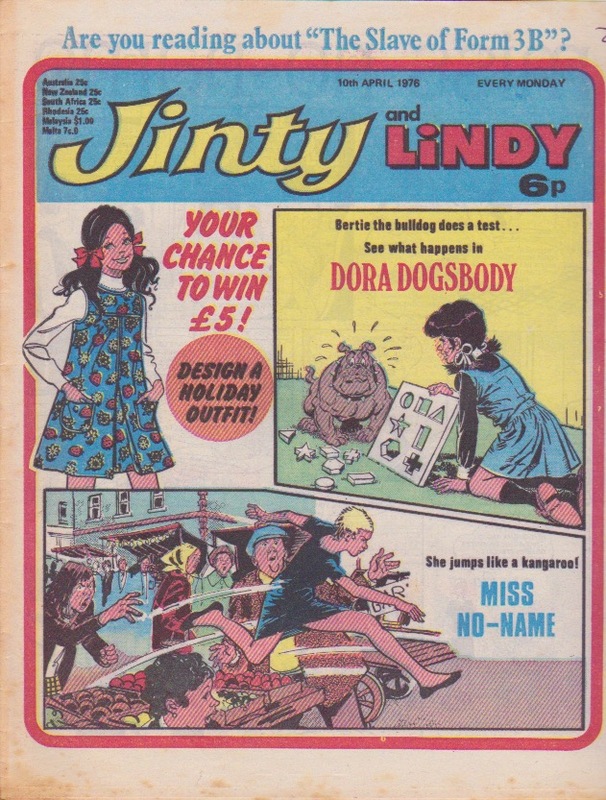 And as the cover says, Miss No-Name’s only friend is a donkey, but Ma Crabb is using it to ensnare Lori even more by threatening the donkey with nasty things if Lori does not do as she says – which includes a dangerous climb on a ruinous tower! Miss Wortley goes too far with her cruelty to Betsy and Betsy collapses from sunstroke. And now Miss Wortley has turned on Mary with a terrible punishment that could cause Mary to die from fright. Next week Betsy resorts to desperate measures to save her, and we have a strong suspicion this will mean doing a runner together. It had to happen. It’s part 2 of the Slave of Form 3B. Stacey is still at the testing stage of her hypnotic powers over Tania. But now she’s satisfied and is out for bigger things with her new power. Nobody is signing the petition to save old Smokey – until they see Gresby bullying Billie! Next moment they’re flocking to sign, so that’s one mean trick that’s backfired on Gresby. But he’s back with another trick – setting Old Smokey on fire! Carrie Lomax is on her way to Scotland to stay with gran, because Mum has too many problems over poor sick Peter to give her the attention she needs. Katie the Jinx and her friends are taking the bus to see a horror movie. But their attempts to get in the mood for it end up jinxing the driver. He is full of dread when he hears them talking about how they are going to get into the mood for the cowboy movie next week. The nasty Walkers and their ally Miss Knight are finding that the Friends of the Forest are very adept at hiding and can’t flush them out. It’s high fashion in Dora Dogsbody as Ma Siddons has them dressing up in smart clothes for a fashion parade. She says it’s all for charity, but when Dora finds that Ma Siddons’ charity is herself (surprise, surprise! ), it’s all hilarity as Dora puts things right. This issue is high on people being wrongly accused of stealing. Lori, aka Miss No-Name thinks she has outsmarted Ma Crabb this time, including walking upside-down on a plank with her feet tied! But she soon finds everything was a setup and she has been branded a thief. Ma Crabb thinks she has finally broken Lori, but instead it just makes Lori more determined. In “Bound for Botany Bay”, Betsy and then Judy have also been branded thieves. The real thief turns out to be a maid, but it’s Judy who’s left carrying the can and throws herself overboard rather than be hanged. The callous Captain leaves Judy for dead, but the second ship sailing not far behind the convict ship has us wonder…. In “Wanda Whiter than White” Susie and her mother have been wrongly accused of shoplifting thanks to telltale Wanda jumping to conclusions. But it is because of this that Susie discovers what has made Wanda what she is – and it is also connected to stealing! It’s the penultimate episode of “Too Old to Cry!” Nell and Sara want to rescue Mr Flicker the horse from Mrs Arbuthnott, but they have to do it without being caught by her incredible talent for lying her way out of anything. The radio says the floods have caused the country to break down completely, and then underlines the point by going dead. But the panel for Fran of the Floods on the cover is jumping ahead a bit – it does not appear in the story until next week! The Friends of the Forest are getting stronger with their friendship, but the danger is mounting. The Walkers’ latest ploy to get to the deer is to pretend to be nice to Sally. Sally soon finds what they’re up to, but not before they have a posse set against her friend Maya. Grandad’s plan to save old Smokey has Gresby going as far as to pay off children to bully Billie. And then he bribes villagers with treats to stop them signing her petition.